Today we’ve got a very special treat – the first creator interview for FIRESTORM FAN! Jamal Igle was the penciller on Firestorm vol III for 23 issues. 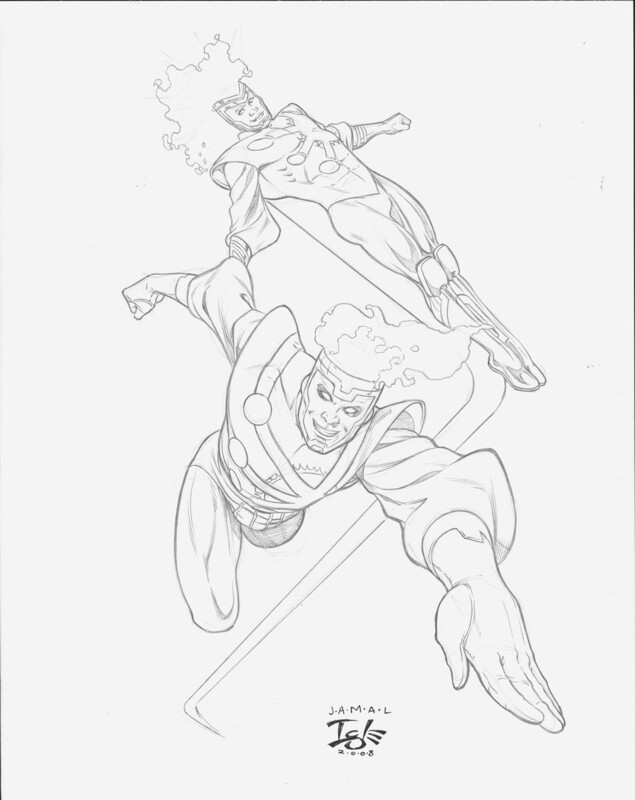 Thanks to the length of his run, Jamal has drawn the Jason Rusch Firestorm more than any other artist. While on the book he had the opportunity to redesign Jason’s costume, bring back Ronnie Raymond, revisit several allies and enemies, and even design some new ones of his own. In addition to pencilling comics, Jamal has been an editor, art director, lecturer, and animation storyboard artist. Currently he is drawing Supergirl monthly for DC Comics and will be drawing the upcoming World’s Finest #3. Jamal was kind enough to spend some time discussing his run on Firestorm with FIRESTORM FAN. 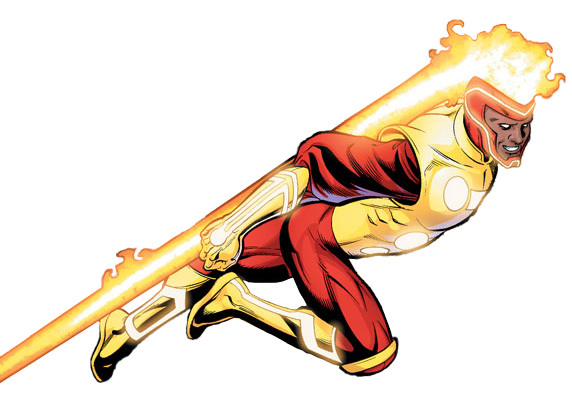 Firestorm Fan: How did you get the Firestorm assignment and were you familiar with the character before taking the job? Jamal Igle: Well, I was actually approached on two different occasions, once by Dan Jolley and later by Peter Tomasi, who was the editor at the time. I turned Dan down initially because although I did want to do it I was otherwise committed. The second time I was still working on one project full time and doing a fill in on Marvel Age Spider-Man when Pete asked me if i was available to do a fill in on the series and I turned him down again. I thought that would be the end of it, but Pete called the next day and offered me the series. I said no again, hung up the phone and walked about 3 feet before screaming out loud “WHAT ARE YOU DOING???”. So I called Pete back and took the job. I was of course very familiar with Ronnie Raymond, having grown up reading the Fury of Firestorm and watching him on the Superfriends. At one point Jay Faeber and I had pitched a Ronnie-centric Firestorm series to DC that went pretty far before ultimately being killed. FF: You worked with both Dan Jolley and Stuart Moore on Firestorm. What were some of the differences in their writing styles? Were they full-script or plot-first? How collaborative were your relationships with them? JI: They were both full script writers and that made it very easy for me. Style wise they were very similar but tonally very different. Dan, by the time I came on the book, was trying to right the sinking ship I guess. DC had asked him to make the series very Vertigoesque in tone but there was a bit of a backlash, not just from the book but the revelation of Ronnie’s death in Identity Crisis. So, he and the editors decided to bring in more aspects from the original series and give Ronnie a proper heroic send off. Stuart was much more about incorporating as much real science into the stories but making them more fun. FF: Do you have any favorite issues or storylines from your time on Firestorm? Or from any other era of Firestorm? JI: Wow, well issue 17 is one of my favorites,which had Jason taking on the Secret society. issues 24 and 25 were fun because it was the first time that I got to draw both Mr. Freeze and Batman. FF: You designed a fantastic new costume for Jason Rusch. How did you go about creating the redesign? Were you provided any input, or was it solely your design? JI: It was my design. We were given the go ahead to design a new suit actually around issue #14 , where we have what I like to call the proto-costume. We wanted the change in costume to coincide with Martin Stein’s return but One Year Later was put in place when we make the jump in issue #23 you see Jason’s current costume. FF: Your new costume for Jason has appeared on two action figures (with a third coming out this year), numerous comics, and is set to appear in the Batman: Brave and the Bold cartoon. What is it like seeing something you designed grow beyond your original involvement? JI: It’s pretty cool actually, you don’t really get used to it. I’ve designed a few other characters like the new Vigilante and Dreadbolt from Terror Titans. I have to admit I get a little upset when I see other artists drawing the costume wrong, LOL. FF: You had the opportunity to redesign several classic characters (Firehawk, Pozhar, Multiplex) as well as design some new ones yourself (Pupil, The Pionic Man, DOLLIES). Were there any you enjoyed more than the others? JI: There were designs that never saw print that I loved but were cut for space and time issues. The Pupil is one of my favorites , I modeled him after a caricature of Peter Lorre from an old Bugs Bunny cartoon. He was just so creepy. FF: You took over the Firestorm book with issue #8. This issue started the return of Ronnie Raymond storyline. Were you aware of some fans concerns surrounding Jason replacing Ronnie? If so, did this affect the way you approached the storytelling? JI: I did, but I try not to think about those things. The truth is, if I let people getting upset about creative decisions bother, I wouldn’t get anything done. I don’t draw to please fans necessarily. Everyone has an opinion about what you should and shouldn’t do. I have to please myself as an artist, and be satisfied with the work first before anyone else sees it. I don’t want to sound like a tool or conceited but you can’t serve so many masters. I’m just happy that other people seem to like my work. FF: You are truly an amazing storyteller, from action sequences to subtle facial expressions. You can do it all. Once you get the script/plot from the writer, how do you tackle it? JI: Usually I read a script two or three times to get comfortable with the story and then I thumbnail the entire story over the course of a day, working out the major beats and getting the general layout down. I really prefer working from a full script because the dialog allows me to think about the acting each character does and staging. Depending on the script and what’s required it’s the hunt for reference. After that I take the first day of the week and layout that weeks pages. So I layout 5- 6 pages in one day and then I spend the rest of the week penciling. FF: You’ve worked with a few different inkers, each bringing their own distinctive feel to the art. What are some characteristics that different inkers bring out in your pencils? JI: Well, let’s concentrate with the three guys I had the longest collaborations. Rob Stull has a very graphic drawing style. Sharp angles and a very slick stylization. Keith Champagne’s work was equally as fluid but Keith in many ways was far more faithful to my line. I always liked Keith’s work because he was a brush inker like myself and inked me in a similar way that I inked my own work. Jon Sibal is phenomenal as well. His style actually brings a rougher quality than I normally have but for some reason it works so well. FF: I understand you’ve lectured for the Museum of Comic and Cartoon Art and the Art Students League of New York. Would you tell us a little more about your involvement? JI: Well I was involved with MOCCA very early on but it wasn’t in an artistic manner. In a former life I worked in public relations so I was assisting them with their PR and marketing. I lectured a few times afterward. the League was my first actual teaching experience. I taught there for two semesters, starting their comics program. FF: Looking back at all the work you’ve amassed, what are you most proud of? What do you consider a high point both personally and creatively? JI: I don’t know. I haven’t done it yet. I’m a work in progress, I feel like my work is getting better with each issue so the next project is the one I’ll be proudest of. FF: Your work on Supergirl is awesome and has been very well-received. Are there any other projects you are currently working on or have coming up? JI: I’ll be penciling World’s Finest #3 but it’ll be Supergirl for the next year. FF: What would your dream comic book project be? JI: I still haven’t done my Superman run. Thanks again to Jamal Igle for generously donating his time to this interview. Be sure to visit Jamal Igle’s blog by clicking here. Jamal’s blog features amazing artwork, updates on current projects, and his convention schedule. Be sure to stop by and tell him FIRESTORM FAN sent you! Also, be sure to support Jamal’s current work on Supergirl. Supergirl #45 is on stands now – check it out! Support Firestorm (and Supergirl)! Fan the flame! Posted in: Comic books, Firestorm #06: Jason beginner, Firestorm #07: Jason post-Infinite Crisis, Firestorm comic vol. III, Gehenna, Interview, Jamal Igle, Jason Rusch. ← Crisis On Earth-Blog: The DC Challenge… Wrong Answer! Always great stuff getting insight from the creative teams! Nice job, Shag! I always think its cool to hear from the artists and writers for character-centric blogs like this!